More than 3 billion liters of water is lost through leaky pipes in the UK every single day. Nearly a fifth (17.6%) of all the water pumped through our water pipes gets wasted. That’s enough to fill approximately 1,262 Olympic-sized swimming pools every single day. 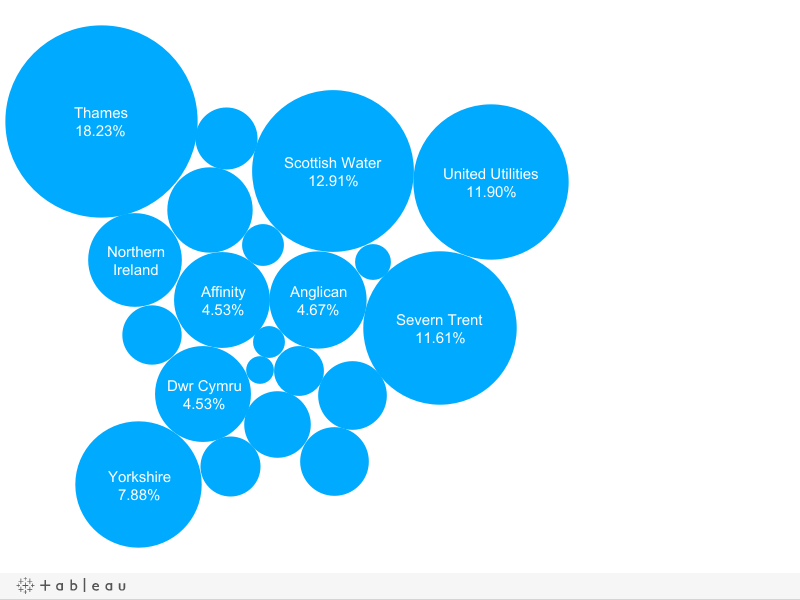 Who supplies Britain’s water, and how much gets wasted? The largest supplier, Thames Water, supplies 2.7 billion litres of water and loses almost 700 million. That’s more than a quarter (26%) of all the water it supplies lost through leaks. In percentages, Thames Water contributes more in losses (18.23%) to the national total than it supplies (15.09%). But the title for worst offender, proportionally, is Scottish Water. They lose a staggering 36 per cent of all the water they supply to the people of Scotland. More than a third – that’s 492 million litres wasted, every single day. The second worst offender, proportionally, is Northern Ireland Water. It loses 29 per cent of the total water it supplies in leaks. There are four other companies that lose about a quarter of all the water they supply. 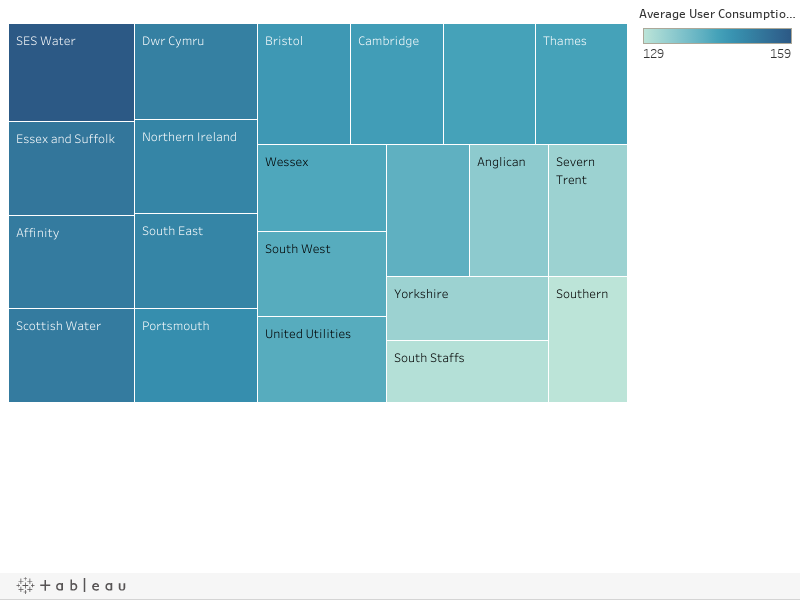 They are Severn Trent (24.58%), South West (24.51%), Wessex (24.18%), and Yorkshire (24.21%). How are the water companies working to reduce leakage? This line graph, showing some of the biggest suppliers, reveals most water companies have not done anything to reduce water leakage. In fact, in most cases, things look to be getting worse. This is not exactly the best start for the water industry, which has pledged to reduce leakages by half before 2050. Northern Ireland Water supplies about 570 million litres per day and currently loses 165 million litres in leaks. It failed to reduce leakage levels and blamed this on particularly bad weather, including the ‘Beast from the East’ that delayed spring in 2018. Why is it so hard to bring water leakages down? Some of the blame is on today’s economy, where it is generally seen as cheaper to drain a river than to fix leaky pipes. Others have blamed monopolism, “opaque financial structures based in tax havens”, and not enough industry regulation. In plain English: because a handful of companies supply all of Britain’s water, there’s little competition or incentive to challenge them and change how things are. This graph reveals those of us who use the most water in litres per day. Customers of SES Water are the most wasteful, using on average 30 litres a day more than Southern Water customers (the least wasteful). Southern Water and SES Water share a boundary with each other which makes it interesting that they are polar opposites on the daily water usage table. According to the WWF, many of the rivers in the South East of England are at or over their capacity for water abstraction. This is a problem because the water companies source most of their water from groundwater and rivers. *Exact number for Northern Ireland Water not obtained. Figure calculated by dividing total number of leaks (in megalitres) by number of households served. Northern Ireland Water loses over a third more in leakages (215 litres) than its customers use (150 litres) per day. Scottish Water, Thames Water, and Anglican (including Hartlepool) all waste a lot more, per household per day, than is used at home. Two other giant water suppliers, Yorkshire and Severn Trent, pretty much break even in how much is lost and how much is consumed. Why do we need to cut down on water wastage? It is unsustainable. With the threat of climate change, longer and drier summers, and with a rising populations, it is essential that we start thinking harder about reducing our water usage. Our rivers and groundwater are already being rapidly depleted. Over-abstraction is also threatening Britain’s chalk streams. Chalk streams are ecologically unique to Britain, hosting wildlife found nowhere else on Earth. Plus, it’s just needless, inefficient waste. If your home is fitted with a hot water tank, adjust the timer so it’s just what you need. This simple step could cut back on greenhouse gas emissions immensely. Each year, the average family creates 1.5 tonnes of greenhouse gasses just by using hot water. It’s also likely to save you money on your water and electric bills. Contact your water company for water-saving freebies. Most water companies actually provide free tools to help you cut down. You can find this service normally by typing: [water company] + “save water” into Google. Here are some of the pages to the big ones: Scottish Water, Thames Water, Yorkshire, and United Utilities. Increase your water pressure in the shower. This might sound like a contradiction, but it isn’t. People who shower with a lower water pressure tend to stay in for longer. Approximately 17 – 25 per cent of household water consumption is taken used up by showering. Cutting shower time shorter by just a minute can save thousands of litres a year. A good ionic shower head can increase water pressure and cut down on water costs, with a plethora of other health benefits, too. Write to your water supplier. Write to your local Member of Parliament. Express your concerns with the excess leakages, and ask what is being done to speed things up. If we can really step up the pressure on these corporate giants, we might eventually be able to get them into gear. And if we all work together, we can finally put the phenomenon of excessive water wastage to bed. We live in uncertain times and water bills are increasing as a result. The water companies should not punish us for their lack of action, but if they do not take the initiative, then we should. Saving water doesn’t necessarily have to be life-changing however, or even inconvenient. In some areas, you might never know the difference – and feel all the better for it, too. Visit our home page, and find out how you can start saving water right away.